By Steve Hare—How could 400,000 hardcover books simply disappear? By Matthew Budman—It’s enough to make you leave that extra copy at home. Well, maybe the extra extra copy. By Karl Orend—After thirty years, Henry Miller’s Tropic of Cancer arrived in the United States, ending literary censorship. By Nicholas Basbanes—Road warriors—or notes from the book fair circuit. By Joel Silver—Type is something you can hold in your hand. David Gerstel—travel and exploration collector. Rare books and corporate scandals; An interview with Aaron Lansky; Hurricane Charley; and more. 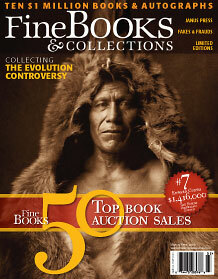 By Ian McKay—Highlights of book auctions worldwide. Fine Pick: Shelf Life, plus Memoirs of a Book Snake.